Seoul (Korea). At the Japanese High School Tournament Koshien on August 23, Shintaro Fujinami led his Osaka Toin High School to the championship, throwing two-hit complete game shutouts on consecutive days in the semi-finals and finals. 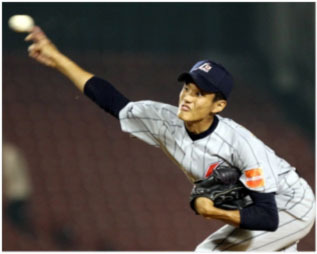 Ten days later he threw a two-hitter against Chinese Taipei at the XXV IBAF 18U Baseball World Championship, leading Japan to a 2-0 win. He struck out 13, while allowing just two hits and a walk in nine scoreless innings. It was the first win for Japan at the event, as they had lost on a wild pitch in the tenth inning against Canada on Friday. Sparked by their ace they won a true pitcher’s duel one day later at Jamsil Stadium. Fujinami received the necessary run support in the second, when Hiroki Takahashi doubled home Fumiya Hojo for a 1-0 lead. In the seventh frame they got some insurance when catcher Tomoya Mori led off with a long flyball to the warning track in right-center field. The ball dropped and when Chinese Taipei didn’t field the relay cleanly he rounded third for an inside-the-park homerun. Chinese Taipei had its best opportunity to score in the sixth inning. Yu Pin Sen worked a one-out, six-pitch walk to reach first base. He moved to second on a ground out and tried to score on a single to right field by Tzu Wei Lin, but Kohei Sasagawa threw him out at the plate to end the frame. Mori, who had tagged out Sen, came through on offense a couple of minutes later and sealed the win.